After nearly a decade of planning, there's just one task left before the Science and Engineering Hall can open – moving in the six departments that will call the new building home. After waiting nearly a decade for the concept of the Science and Engineering Hall to become a reality, it’s almost time to cut the ribbon. That leaves just one more task: moving all six engineering departments and faculty from other schools, along with two-thirds of the labs across campus, into their new home. It’s easier said than done, professors with knowledge of the plans say. Officials have meticulously planned the move since the summer, and professors will pack up their belongings before two companies move computers, generators and hazardous chemicals into the new, $275 million, eight-story building at the end of December. Alex Klemko, chief executive officer of Moving Masters, said his company will begin the moving process at the end of December. 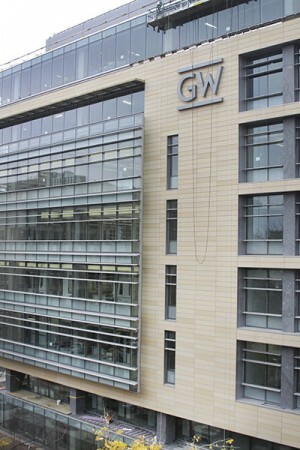 He said GW’s campus presents unique challenges, but movers are experienced in doing jobs in Foggy Bottom. “Being an urban campus, its houses and buildings have narrow stairs and with heavy items it’s always a challenge,” Klemko said. The moving of large pieces of laboratory equipment will be left to JK Moving Services, a company that has previously moved lab and medical supplies across the D.C. area. Some of the departments will move in during the early weeks of 2015 “with a majority of the moves set to be completed in time for the start of the spring semester,” University spokeswoman Maralee Csellar said. Kay said he typically continues his research during winter break, conducting as many as four experiments during that time. This year, he may have to give up two of the four weeks he and his students use to focus on their research. He added that some labs, like the engineering teaching labs used by the department of electrical and computer engineering, would be more difficult to move because of the number of computers and pieces of equipment. “There’s going to be a big time crunch to pack everything up in Tompkins, move it over and unpack it,” he said. Murray Loew, a professor in the biomedical engineering department, said his move will be simpler because he does not have a lab. He said faculty will have to accept that their research may not make the move over to the Science and Engineering Hall in one piece, but any delays will be worth it to have access to better facilities. He added that if professors prepare their equipment and materials, the actual move will be easier. Hermann Helgert, a professor of electrical and computer engineering, said professors were asked to sketch out their new office spaces and help pack up the books, files and other items that would be making the journey across campus. He said the move would begin around Dec. 29 and all faculty in SEAS would have office space in the Science and Engineering Hall, but there wasn’t enough space in the building to house all of the professors’ labs. “Some labs and some equipment may stay in Tompkins for the time being,” he said.